As published in Página 12, April 18th, 2015. By Jorge Elbaum, Sociologist, former DAIA executive director. In December 2012, Foreign Affairs Minister Héctor Timerman visited DAIA and held a meeting in the 17th floor of Pasteur 633 with the executive board of that entity, in order to explain the details of the negotiations carried out with the Islamic Republic of Irán at that moment. 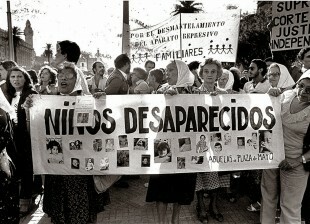 Relatives of the victims of the terrorist attack against the AMIA were in that meeting, which was summarized by the president of DAIA, Julio Schlosser, as follows: “what really matters here is the victims’ opinion, and they expressed clearly that this meeting has been highly positive… If it has been positive for the relatives, then our opinion is redundant”, said the president of DAIA once the meeting with the Foreign Affairs Minister had finished. The same afternoon that meeting was held, December, Wednesday 27th 2012, at 19 hours, the General Secretary of that entity, Jorge Knoblobitz, told close friends and allies that he had received a phone call from journalist Pepe Eliaschev, who warned him in outrage that the cordial reception of Minister Timerman was going to be emphatically repudiated by “the community” as well as American and Israeli embassies. After that call, several spasmodic meetings followed, until the vice-president of DAIA, Waldo Wolff, revealed what was really happening: there was clear pressure “over the phone”, aimed to question any negotiation with Teheran. Those pushing on the phone in the morning of December 28th, 2012 claimed that any agreement would turn the ayatollahs in international political actors, when, in fact, they should be labelled in the national public opinion as bellicose terrorists unable of making any diplomatic agreement. Among the angry phone lobbyists, stood out the cellphone numbers of Santiago Kovadloff, Daniel Sabsay and Marcos Aguinis, who later on become avid organizers of the umbrella’s rally of February 18th. From March on, they also decided to monthly commemorate (along with Nelson Castro) the memory of the late public prosecutor. In January 2013, the President made public the agreement achieved with Iran through the “Memorándum de Entendimiento” and affirmed that it would be treated in extraordinary sessions in the National Congress. 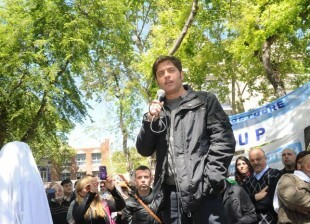 March 11th 2013, after the Memorándum was approved by Congress, a meeting in Arlington, D.C., was hold by American Task Force Argentina’s members (ATFA), who decided to incorporate the “Memorándum de Entendimiento” as another battering ram in the strategy to force our country to negotiate from a more vulnerable position with the speculative funds. 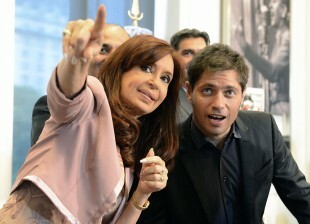 In addition to the negative campaign over the agreements with Teheran through advertisements in different newspapers, ATFA resolved to contact local leaders and politicians and ask them to pronounce critical judgements over the agreement, as well as offering any kind of “collaboration” to boot out Argentina’s Government. 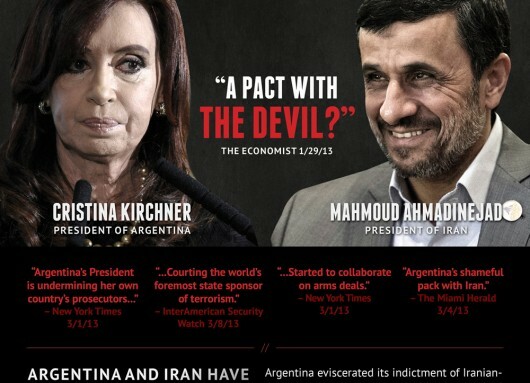 July 2nd 2013, ATFA, funded mostly by Paul Singer, president of NML Elliott, published an advertisement titled “Shameful allies”, that shows a picture of president Cristina Fernández close to the, at that moment, persian president Mahmud Ahmadinejad. 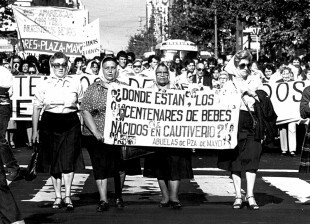 In catastrophe fashion the ad reads:“Time has come the time to stop Argentina from breaking American and international law”. 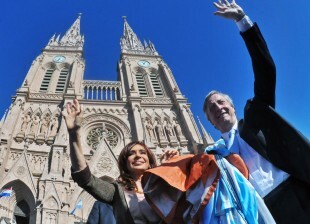 June 16th 2014, the Supreme Court of the United States of America decides not to take the case of Argentina’s debt, giving free way to the Judge Griesa to continue protecting the international speculative funds. July 9th 2013, republican Jeff Duncan, responsible for the Homeland Security Committee of the House of Representatives (who received the “contribution” of US$10 thousand from the Political Action Committee of the organization “Each Republican is Crucial”, funded by Paul Singer, in September 2012), sent a letter to President Cristina Fernández, claiming that he was disappointed by the decision of Attorney General, Gils Carbó, of not allowing Nisman “come forward” before the Capitol. Two days after the letter was sent to the President, Duncan sent another missive to Secretary of State John Kerry with the warning that “Argentina may be trying to support Iran’s illegal nuclear program” and demands that Kerry consider possible ties between Fernandez’ government and “the greatest world sponsor of terrorism”. Around the same time, Republican Senator for Illinois Mark Kirk sent yet another letter to President Kirchner questioning her dealing with Iran. Postage of this missive and other large expenses of the Senator were financed by Paul Singer through a USD 95.000 donation, according to the International Press Service’s report from August 7th 2013, quoting the Center for Responsive Politics, an organization that monitors political donations in the USA. Two days after these three letters were sent, prosecutor Nisman began a round of meetings with the heads of the Jewish organizations DAIA and AMIA in which they agreed steps to prevent the implementation of the memorandum with Iran. During these meetings, which took place in a coffee shop on 1601 Juana Manso St. in Puerto Madero (Buenos Aires), Nisman fervently repeated that he was willing to put money “out of his own pocket” to help DAIA destroy the memorandum. “If necessary, Paul Singer will help us”, he declared to his astonished café companions. Nisman’s offer became an open secret in the Pasteur building, stirring a debate between the more practical group –who was willing to accept the potential financing to fight the memorandum- and those who refused to accept “help” from a hedge fund whose practices violate the Jewish principles against usurious interests. Financial debates were silenced, although today we have the information of a New York bank account revealed by one of its owners, IT guy Lagomarsino. He informed the judge of the Merrill Lynch bank account 5v3-50653 based in New York. This account was opened on February 2010, when Nisman traveled to Washington. Coincidences pile up when we think that by this time the prosecutor began his frenzied campaign against the Argentinean government’s intention to bring the Iranian defendants to declare. It was then, curiously, that he hired (with public funds) the services of Mariela Ivanier, head of the consultancy firm Verbo Comunicación. Ivanier had worked for over 5 years as a lobbyist for Papel Prensa and newspapers La Nación and Clarín, companies for which she still works today. Also, Ivanier has provided services for mutinational Estée Lauder Companies, belonging to the current President of the World Jewish Congress Ronald Lauder, an international entity in which DAIA is partner and that receives yearly donations from hedge fund NML Eliott. Throughout 2013, the Foundation for Defense of Democracies (FDD), a Republican think tank whose executive director is Mark Dubowitz, released six “studies” aimed at reviling Argentine policy on vulture funds and negotiations with Tehran. In an interview with CNN, Duvowitz declared to be a personal friend of Nisman´s and denounced that the late prosecutor had told him in confidence that he had received pictures of his daughters in an attempt to intimidate him. One of Dubowitz’s subordinates, Jonathan Schanzer, devoted himself to investigate the “obscure connections between the Argentine government and Tehran” in a paper released by the FDD in August 2014. 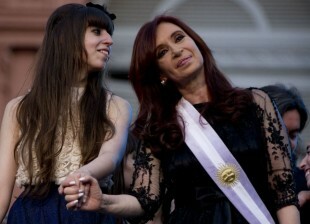 What’s noteworthy is that the Foundation for Defense of Democracies led by Nisman’s close friend has received 3.6 million dollars between 2008 and 2014 as donations from Paul Singer, as mentioned in the tax report made by the International Press Service. Last February the current DAIA secretary general, Jorge Knoblovitz, toured the US denouncing “Nisman’s murder” and the rule of impunity in Argentina. The rallying claim of his tour was the assertion that the prosecutor was victim number 86 of the AMIA bombing. He told a community newspaper from Miami that “DAIA understands that the AMIA case should now be internationalized”, and in order to achieve that internationalization he met with the president of the Anti Defamation League, Abraham Foxman, a Republican partner of the Institute for National Security Affairs (JINSA), an entity that has received 250 thousand dollars from Paul Singer during the last two years. During and after the tour, current DAIA vice-president, Waldo Wolff, gave free rein to his Twitter instincts by stating that “Nisman was ‘made absent'” by the government as a result of his complaint against the President. Days later he said in the social network of the little blue bird –after the court rejected Pollicita’s request– that there was “nothing to celebrate”. Should there be a will to dismiss all of these striking coincidences, which could very well be dubbed a “money trail”, then perhaps the investigation should be started backwards: after the prosecutor’s death a website was created, with an American domain, as a tribute to Nisman. The goal of said site is to recognize “those who similarly strive for justice and show exceptional courage in the face of substantial odds”. The http://albertonisman.org site promotes an international prize to honor the late prosecutor. The prize is called Alberto Nisman Award for Courage and is endorsed by the Foundation for Defense of Democracies (FDD) of Nisman’s close friend Mark Dubowitz. The prize is funded, as expected, by the lord of the vultures, the head of NML Elliott, Paul Singer.